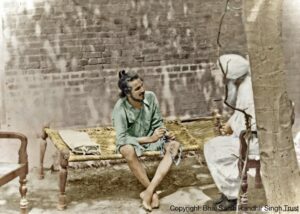 Bhagat Singh meets Bhai Randhir Singh in Lahore Jail. AT LAST THE day came, It was 6 P.M. on 4th October, 1930. The news of my release was announced and everyone was very happy about it. I was sitting in a blissful solitude within my cell. All the patriots rushed towards my cell to break the news to me and congratulate me. The first to come and congratulate me was Bhai Gajjan Singh (Master). In a matter of minutes other patriots gathered around me and read joyfully the orders of release. I was overwhelmed not so much by the joy of release as by the separation I would have to bear from devoted friends like Bhai Kartar Singh (of Canada). I was overwhelmed by these dual emotions of joy and sorrow when friends came to bid good-bye with loving embraces. The prison officials stood there ready to carry out the order of my release but my feet were reluctant to move away from such dear companions. I embraced everyone of them and after a few affectionate words with each one of them, I left them all with tears in their eyes. The stream separated from the river at last. When I went out of these prison-wards I met Mohammed Akbar near the central dome. He was smiling and coming towards me. On seeing me he congratulated me for my release. Inattentive to his felicitations, I told him that it was time that he should fulfil his promise. He should not miss the chance. He smiled and said that he had already made arrangement for the meeting with Bhagat Singh. You could now meet him for full two hours. I asked him if he had taken permission from the Superintendent. Daroga: Before I found it necessary to ask him, the Superintendent was already worried and puzzled and was seeking a way out of a difficult situation. His worry is that you should be quietly released without giving any chance to outsiders to make much noise about your release. He asked me to find a way out of this difficulty. He said, there are regular pickets of people outside, who are waiting for the news of the release of political prisoners. As soon as a political prisoner is released the news spreads like fire and there is a great noise and hubbub of long processions, which are very disturbing to the Government. The Government has issued strict instructions, that the release should be secret and quiet. You see people sitting near the prison gates in regular pickets till sunset you must make some arrangement to send Randhir Singh out secretly and quietly so that we may not be blamed for anything later on. At that very moment I asked the Superintendent not to worry and suggested to him the plan, saying, “You remember sir, the day Randhir Singh came to this prison, Bhagat Singh who has been sentenced to death submitted an application for permission to meet him, but you rejected it. I believe that if we now allow him to meet Randhir Singh, the meeting may take about two hours. It will quite dark by then and by 8 P.M. we will send Randhir Singh out. Thus strict secrecy about the release will be maintained.” The Superintendent was impressed by this suggestion and gladly issued orders to allow this meeting and you can talk freely as long as you like. I will now give you a warder, who will guide you to Bhagat Singh. So saying, he sent a prison-warder with me and ordered him to permit us to have an unrestricted meeting. Bhagat Singh was taking his daily stroll in the prison compound. He had been told about the permission granted for this meeting. On seeing me he came running towards me. I was standing outside the fence of the courtyard. He came close to the fence and greeted me with great love and affection, bowing low out of reverence. I also folded my hands and greeted him warmly. The warder moved away when we were together. Even the policemen on duty in the compound kept away from us. We were all alone facing each other. Bhagat Singh was so overwhelmed by the joy of meeting after months of anxious moments, that tears rolled down his eyes I had hardly met anyone in life who had developed so deep affection and love even before coming into contact with me. It appeared we had known each other for long time. In a rapturous tone he said, “O I can hardly say how happy I am today on having met you at last. Day and night I was restlessly longing for just a short meeting with you. At last the blessed moment has come and my wishes have been fulfilled. After knowing all your great sacrifices and suffering in prison, I had become your keen admirer and passionate devotee. It was the heroism of the great freedom fighters of 1914-15 like you which inspired insignificant patriot like me. All our revolution exploits are nothing compared to the astounding heroic deeds performed by you and your companions. Your own life and struggle for freedom and rights especially impressed me. Munshi Manna Singh perhaps told you with what passionate longing I was thirsting to meet you and talk to you. I should say that my inner attachment and admiration for you brought you back to Lahore prison after sixteen years. When I first sent a message to you within this prison, that I was anxious to meet you I received your divine command to keep the Sikh symbols (beard and hair). I am prepared to abide by your wishes. I am really ashamed and am prepared to tell you frankly that I removed my hair and beard under pressing circumstances. It was for the service of the country that my companions compelled me to give up the Sikh appearance and disguise myself as a sannyasin. So it is in association with the irreligious people that I was compelled to show disrespect to my religious symbols, but now I will certainly do whatever you wish me to do. “Brother Bhagat Singh ji, I am deeply touched by your love for me. I am also impressed by your spirit of service and patriotic zeal, but I must tell you dear brother, that your companions did not give you good advice. You seem to be seeking something very petty and you became a prey to the evil and mischievous suggestions of your companions. Compared to our times the period in which you participated in the freedom struggle, is a period of great awakening. You could fearlessly take part in the freedom struggle and serve your country and humanity as you wished. But you must be knowing that in our times (1914-15) few and rare souls felt inspired to dedicate their lives to the cause of freedom. In the Punjab only a few Sikhs who could be counted on finger-tips were politically awake, felt the patriotic fervor to fight for freedom. There was a great feeling and political opposition to the heroic Ghadar Leaders and patriots who had come from Canada and America. Every child in the Punjab was opposed to them. I will give you only one example of the moral courage of the great patriot of those days. Bhai Nidhan Singh of Chugga village was a great patriot and fighter for freedom, who inspired hundreds of Indians living in foreign countries to come to India and dedicate their lives to freedom struggle. He spent thousands of rupees from his own pocket for freedom struggle. And yet he did not disguise himself. He came openly by sea but the Government at once made elaborate arrangements to arrest him. He reached India along with his companions without being detected. He could not be arrested. He came to the Punjab and threw himself heart and soul in the freedom struggle. His heroic deeds for the cause of freedom must be known to you. Warrants for his arrest had been issued, his photograph was widely publicized and a price was set on his head. There was an all out attempt to arrest him. He moved swiftly from one place to another organizing the freedom struggle. There was no sympathy and support for these freedom fighters in the public. The patriots depended mostly on Bhai Nidhan Singh for organization and inspiration. Of course in fearlessness there was none so daring as Kartar Singh Sarabha. One day Kartar Singh Sarabha feared that Bhai Nidhan Singh may be arrested. He was the key figure among the freedom fighters and it was necessary that he should not be arrested soon. Keeping only the political interest in view he suggested to Bhai Nidhan Singh that he should dye his beard and thus change his publicized appearance to some extent. Bhai Nidhan Singh boldly answered that he would never do such a thing and tarnish and disgrace his heroism in the freedom fight. “You can use me as best as you like with this appearance only and do not make any suggestions which would make me a coward” he said. His companions wanted him to fall a prey to their evil suggestions but his determination remained unshaken. For organizing the freedom struggle, he traveled twenty to thirty miles a day and sometimes fearlessly passed close by police posts. He performed such heroic deeds compared to which your plans were insignificant. He did not even agree to change the color of his beard, while you went to the extent of removing your hair and beard. Bhagat Singh: Actually, I did not murder Saunders. I was of course accused of having murdered him. I considered it a great heroic deed and so took the credit for it. I confessed that I killed Saunders. Whether there was any benefit in it or not, I nevertheless got the credit for the whole deed. Even otherwise there was no escape for me. I: The ideal of a true patriot is never to seek such petty joys of empty credits. For the joy of getting worldly praise you did not hesitate to fall from a higher spiritual ideal of becoming an apostate from Sikhism, nor did you ever repent over this fall from a much higher ideal. All that you have achieved by this wrong step is some trumpeting of your name and heroism by some papers. You gave up the Guru’s personality for false glory and empty ambition. If you felt that you made a mistake you should have repented and come back to the Khalsa ideal by maintaining a Sikh-like appearance again. Why did you not do it? Bhagat Singh: I might have kept the Sikh like appearance again, but then I would have lost the friendship and sympathy of my comrade B.K Dutt. Secondly; I would not have got so much publicity as I am getting now. It is true that my sacrifices are insignificant compared to the sacrifices of the freedom fighters of 1914-15. But after such astounding sacrifices they did not get any publicity or praise in the papers. The Sikh papers had very limited circulation. Even they did not reveal all facts of the heroic deeds of patriots like you, because their timid policy prevented them from writing anything frankly. It is the non-Sikh papers which publicized my name widely and it is through them I have acquired all the glory associated with my name. It is a fact that if I had maintained the Sikh appearance and if I had professed myself to be an orthodox Sikh and kept hair and beard the non-Sikh papers would not have written a word about me, just as they did not write a word about you and your companions. Even out of Sikh papers “The Khalsa Akhbar”, Lahore, an urdu paper, dared to write something about you. I know it for certain that Hindu papers are always reluctant to write even a word in praise of Sikh patriots and freedom fighters. They do not like Sikhs being praised for anything. If I had kept hair and beard again and become a Sikh, they would have started belittling me instead of praising me. So I hesitated to keep hair and beard again. On hearing this Bhagat Singh was deeply moved and said “The ideal of Sikhism is no doubt very high. The world in general hankers after empty glory only. I also drifted in the same passion for personal glory. But today I have realized that all these things are idle exhibition of vanity, conceit and self-glorification. I would have been fortunate if I had got the opportunity of living in close association with you for at least three or four months. If I had got this opportunity to live in your company for three or four months, I would have gained much and all my shortcomings would have disappeared. Now I will do whatever you ask me to do. You now want me to become a kesha-dhari Sikh. I now admit that I made great mistake. Even contrary to this healthy family tradition, I went against the Guru’s instructions and showed irreverence to the Sikh symbols. But there is one more fact, and I would be committing a sin if I conceal it from you. I kept hair and beard merely because there was a long standing tradition in our family to do so. I am very proud to be called a Sikh. But the hard fact is that I was never religious at heart. You will excuse me if I tell you in quite plain terms that at heart I am an atheist. I still do not believe in God. All my companions know it. With all that I am willing to do anything you ask me to do. If you command me, I will keep hair and beard. Alas! if only I had got the opportunity to stay near you a little longer you could have changed my atheistic views. I: I am very happy that you have revealed the truth of your inner state of mind and have not concealed what is really in your heart. It is absolutely useless to keep religious symbols like hair and beard while you are an atheist at heart, nor would I be proud of making you do such a thing. I am no more anxious about your coming back to Sikh forms, nor am I sorry that you do not have hair and beard. My only anxiety and wish now is that you should die with faith in God. You will definitely die on the scaffold. It would have been better if your atheism had disappeared before you faced death sentence. Even though you are an atheist remember one thing that you will not die, keep it engraved in your heart that you will not die. You will be born again. Your soul is immortal and ageless. It will never be destroyed. It will be born again and again. Know this for dead certain that you will not die. You will take human birth again. Look within and see what you are? Are you a soul, a spirit (Atmo) or just a lump of flesh and blood? Do you think that this self within you which speaks, understands, thinks, reflects on serving humanity and expires after doing great deeds, is nothing beyond bones, blood and flesh and do you think it will end with the end of the body? No, never. Your real self will not be destroyed and you will never die”. On hearing these words which were uttered in an inspired mood (by the Grace of God), Bhagat Singh stood there mute and inwardly moved. For a moment he lost his physical consciousness and his mind soared high. Speechless, he bowed low, as if some unknown power had taken possession of him. For quite sometime he remained absorbed in deep silence. I shook him with my hands and helped him to stand. On his face there was a strange glow. He came nearer me and stretching his hands through the fence he tried to touch my feet. I held his hands in mine and said that only the Guru’s feet are worth worship and not human feet. I helped him to stand up and when he had regained control over himself he said “Your words have pierced my heart like an arrow, my disbelief and faithlessness have been terribly shaken, a magnetic influence has changed my inner being. Deep down in my heart now I believe that I will not die and this belief will remain unshaken in my mind, speech and actions. I am that Spirit that death will not destroy. I will not die. After I give up my body I will be born again. Until my new birth my Atma will remain in everlasting glory. When I die on the scaffold I will die with a great spiritual joy. I was brave through sheer will power and asserted that I did not care for death. Within my heart was the deep hidden sorrow of complete extinction after death. Whenever this thought came to mind there was darkness before my mind. The thought of being reduced to nothingness after death created a painful void within my heart. Your words have brought a miraculous change in me. I can now see my future clearly in the light of new consciousness you have given me. The void created by the thoughts of extinction have disappeared. All doubts and delusions have been dispelled. “I have gained much more strength. I will now die with great moral and spiritual courage. Your exalted life has imparted to me the elixir of spirituality and I feel its ennobling influence. I knew one thing about your life that you always say what you have experienced and your words and actions are always in unison. Not only am I convinced that I will not die, and that I am immortal Atma but I am convinced that there is God and you have had a glimpse of Him. So now you will be extremely pleased to learn that your dear Bhagat Singh is a believer in God and he will die with complete spiritual faith in Sikhism, and according to the Sikh terminology, I will face not death but ascension. The word ascension is a beautiful word and reveals that the soul will rise above the body and go beyond death. After leaving my body my spirit will ascend heaven-wards and will never die. It will be born again and will work for the ideal service of the Motherland and the nation. How fruitful has been this meeting with you. Audio in Punjabi for the above as audio chapter.